The American designer used bright color and fun prints for his spring 2019 collection. 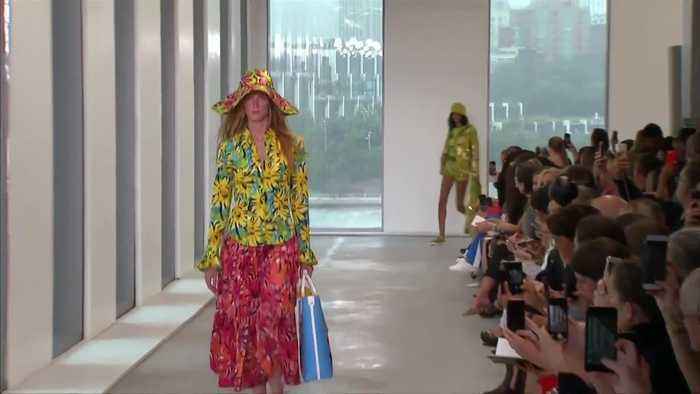 ROUGH CUT (NO REPORTER NARRATION) STORY: Michael Kors has booked fashionistas on a global getaway with his spring 2019 collection which debuted at New York Fashion Week: The Shows on Wednesday (September 12). With 65 looks the American designer wanted to create an escape to optimism, joy, diversity celebrating beauty. "I think that, you know, most of us spend our lives in cities, locked in our offices busy, stuck in traffic. And I think that, you know, as of late when you look at the phone, which unfortunately for most of us is constantly, there's lots of grim news globally," said Kors before his show at lower Manhattan's Pier 17. Bright colors and bold prints filled the collection of women's and menswear. The relaxed line featured a refreshing color palette with watermelon, lemon/lime and aqua as its main hues. Fun prints keep the looks youthful with florals, graphic stripes and dots. Celebrity fans including Tiffany Haddish, Nicole Kidman and Catherine Zeta Jones filled the front row.